As a whole, Aliens: Colonial Marines leaves a lot to be desired. It's a middling, but very dated, first-person shooting experience. As such, it's a game that only some will enjoy. It was back in 1979 that director Ridley Scott took theatrical audiences on a trip to space aboard a towing vessel dubbed Nostromo. Known simply as Alien, that benchmark film has since become a beloved science fiction classic, and has spawned three branded sequels, plus spin-offs. In fact, even though we’re approaching the forty-year anniversary of its inaugural celluloid voyage, movie fanatics still can’t get enough of the franchise’s iconic, yet nightmarish, Xenomorphs, and its unwavering heroine named Ripley. Several years after Ridley Scott’s intergalactic tale gave moviegoers ooze-filled nightmares, Canadian filmmaker James Cameron took the reigns and gave fans the sequel they’d been wanting. Utilizing a pluralized version of its predecessor’s title, it released to great fanfare, and has sparked countless arguments since. That’s because, unlike most sequels, Aliens actually got things right, delivering a shadow-filled experience that is arguably better than that which came before it. As such, it was no surprise when the film ended up winning multiple awards, including golden Oscars for Sound Effects Editing and Visual Effects. After narrowly escaping a self-destructing ship and an extraterrestrial threat in Alien, Sigourney Weaver’s Ellen Ripley survived another great hardship at the end of its first sequel. It was after a battle with the menacing alien queen that the heroine and her surviving comrades entered into cryogenic sleep aboard the Sulaco, leading to the flame-filled events that kickstarted Alien 3. I apologize if you’ve yet to see Aliens, but spoiling the ending of the film, and that of its predecessor, was imperative for the purpose of this review. That’s because, while Ripley and company entered into cryogenic slumber at the end of the movie, a search party was sent out to discover their whereabouts. However, we’re not talking about a filmed excursion this time. Instead, the officially recognized and canon events in question unfold in interactive form, through Gearbox Software’s Aliens: Colonial Marines. 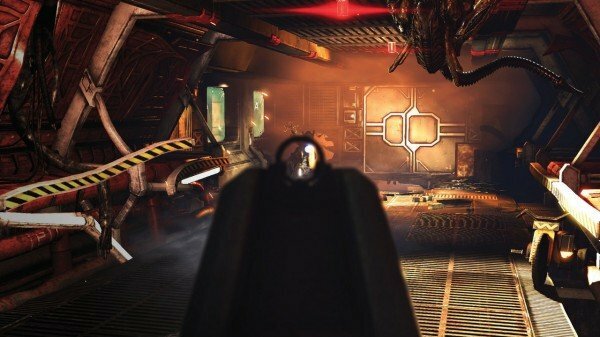 Having just been released after a tumultuous six-year-long development cycle, Aliens: Colonial Marines looks to provide fans with what you could refer to as a narrative bridge. It does so by placing gamers into the role of Corporal Christopher Winter, a steadfast soldier who leads a group of fellow marines in search of the missing survivors. Expectedly so, that great showing of will and human spirit ends up putting the group into dangerous territory, as they board the Sulaco and come face-to-face with the ungodly Xenomorphs. Played out over the course of eleven campaign stages, the aforementioned plot line visits familiar territory, while attempting to complement iconic fiction. Does it succeed in that venture? Yes and no. Although there are certainly some interesting developments that occur, the story isn’t nearly as memorable or well-developed as it could have been. The showcased events feel more generic than they should, and the heroes that we’re supposed to care about lack the necessary humanity that we’ve come to expect from this sci-fi behemoth. As such, non-gaming Aliens fans won’t have to worry about missing much by avoiding picking up a controller and enlisting into the Colonial Marines. Unfortunately, the game’s storyline isn’t its only generic and underwhelming aspect. That’s because its gameplay mechanics also leave a lot to be desired, making the experience feel more like a traditional first-person space shooter set in the Xenomorphs’ world, as opposed to a fresh and memorable interactive Aliens sequel. It’s a shame, but it’s true, and honestly didn’t come as much of a surprise, given how long Aliens: Colonial Marines spent in development. When it comes to gameplay, the main problem with Aliens: Colonial Marines is that it’s stuck in yesteryear. To be frank, the entire experience feels as if it should have launched alongside the Xbox 360. It’s basic, happens to be dated, and lacks quite a bit of polish, offering an experience that could be referred to as somewhat archaic. Needless to say, it’s not something that will compare against 2013’s best, or anything recent for that matter. Granted, just because something is old (or feels that way) doesn’t mean it’s bad. After all, some of the first games ever created are still a heck of a lot of fun to play. Unfortunately, this one isn’t overly enjoyable or entertaining, and is simply ho-hum. It’s not awful, and isn’t necessarily a bad game; it’s just not a good game. It simply hovers over the fulcrum of mediocrity, occasionally swaying one way or the other. Think of a game like DOOM 3, and you’ll have an idea of the type of first-person shooter that this is. You walk through darkened hallways, destroyed spaceships and downtrodden landscapes, as monsters rush towards you. Yes, the Xenomorphs aren’t nearly as stealthy as you’d expect, taking away from the claustrophobic horror that the game’s inspiration made famous. Most of the time, they’ll run and/or leap towards Corporal Winter and company, as opposed to stalking them and taking the quiet approach. Surely that decision was made to keep things action-packed, but it leaves the experience feeling uninspired. When it comes to combat, like any other traditional first-person shooter, it’s almost all about the guns. 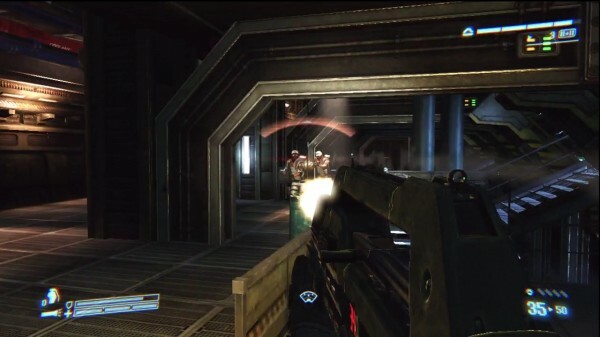 The Colonial Marines are able to carry three weapons at once, and what’s equipped depends on what the player picks up during his or her travels. For some reason, you’re unable to select which weapons you want to equip, so picking up a new weapon means that you must say good-bye to your previous metallic comrade. I felt disappointed when I realized that I’d switched out my machine gun for a second shotgun, to go along with my ever-helpful pistol sidearm, but ended up finding peace in that development after I realized just how overpowered the game’s shotgun blasts are. It doesn’t matter what weapon you have in hand, be it one of the basic ones or one of the six legendary guns that can be found throughout the campaign; you’ll still be forced to deal with what is a very frustrating cover system. 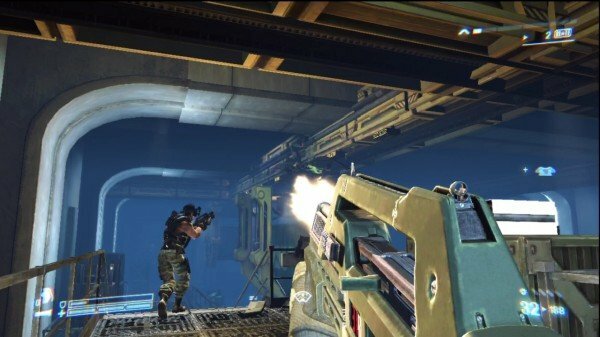 Unlike today’s games, where sticking close to cover provides safety, Aliens: Colonial Marines only allows players to duck behind environmental objects. The result is a lack of protection, as the game’s sharpshooting (and incredibly annoying) human enemies are occasionally able to send bullets flying into Christopher Winter through cover. Thankfully, his health regenerates, although the same cannot be said about his shield. Sure, there are plenty of shield pick-ups to be found, but it doesn’t take long before the protection becomes moot. At least that was the case on hardened, the game’s third of four difficulty levels. Those who like a good challenge will definitely find it here, provided they play on one of the harder difficulties, but the experience’s challenge level is also affected by its clunkiness. A great example is the mechanic that governs how Winter throws grenades. Instead of being able to press one button, as you would in most games, you’ll need to press left on the directional pad to equip one, before having to aim and throw it by pressing the right trigger. The two-step process is completely unnecessary, and ends up leading to damage during firefights. What’s worse is the fact that there are three different types of explosives that can be used, meaning that one must cycle through a list in order to choose the correct one for any given circumstance. It goes without saying that playing through a game like this by your lonesome should be challenging on higher difficulties, but Aliens: Colonial Marines tends to like to create cheap deaths. As a result of problematic artificial intelligence – which saw my allies shoot at many walls throughout the campaign – enemies would sometimes appear behind me, seemingly out of nowhere, quickly delivering a kill shot before I could even react. The same was true of the opposition’s grenades, which exploded very quickly, and almost always meant instant death. Then again, if I had been playing through the game with up to three friends, that probably would have saved a lot of frustration. However, I chose to go it alone. Although Aliens: Colonial Marines is problematic and dated, it’s not devoid of entertainment value. Of course, how much one enjoys playing a game like this will depend on his or her ability to overlook issues and appreciate things for what they are, as opposed to what they should have, or could have been. 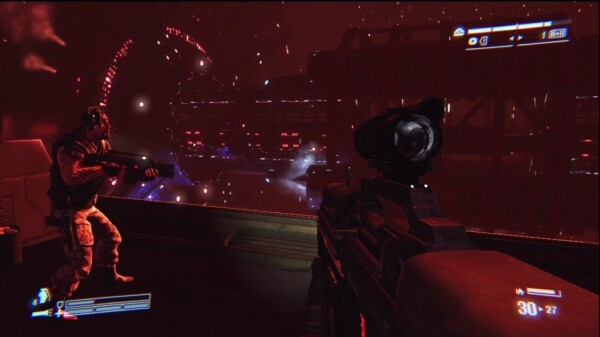 This isn’t Halo 5, nor is it anywhere close to the quality of Halo 4, or something like it. Going in, you’ll need to understand that you’re playing something that spent a long time in development, and will need to adjust your expectations as a result. If you can do that, like I was able to, then you’ll have some fun, although I find it safe to say that you won’t come close to being blown away by what you’ve purchased or rented. At most, this is a mediocre-at-best weekend play through, as the campaign isn’t something you’ll really want to replay, and the included multiplayer probably won’t have you sticking around for long. While we’re on the topic of competitive multiplayer, it’s important to note that there are four different modes on these branded discs. Unsurprisingly, they pit players against each other as different species, letting one team play as radar-using humans during one round, and sound-sensing Xenomorphs during the next. That idea forms the basis for the available gameplay modes – a list that inclues a basic team deathmatch option, along with survival, escape and capture variations. Combined, they offer a couple of hours of enjoyment, but frame rate issues and dated design elements keep them from being anything worth writing home about. One nice thing that players will surely appreciate is Aliens: Colonial Marines‘ experience system, which isn’t limited to multiplayer confines. Experience is earned by killing enemies, finishing missions and completing challenges throughout the campaign, leading to rank increases. Levelling up through this process then allows players to upgrade their weapons via an arsenal menu. 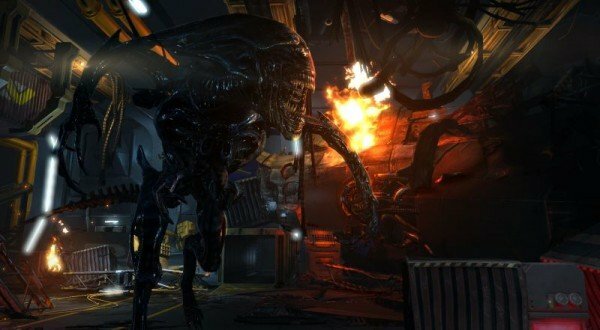 However, since you can’t play as an alien during the main experience, the developers made sure to include a separate experience slash upgrading system for the Xenomorphs. It only comes into play during multiplayer, and helps players customize their different species, much like they can customize their playable humans through the availability of basic options. Now that we’ve analyzed the canon, mechanical and competitive aspects of Gearbox Software’s latest interactive release, it’s important to discuss how it looks, sounds and runs. However, it must be said that the game doesn’t excel in any of those areas, which is too bad, considering the great presentation values that its predecessors boast. Sure, it runs relatively well, despite some screen tearing and occasional hiccups of the frame rate and glitch variety, but that’s all that can really be said. It looks very dated, which is to be expected and can be overlooked, but it should have performed better than it did. Additionally, the sound design is also quite mediocre, with middling voice acting, unspectacular effects and merely half-decent music. In closing, Aliens: Colonial Marines is what it is. That is, something that you’ll either find mildly enjoyable, or something that you will dislike with ease. Thanks to a lengthy development cycle, delays and issues, the game isn’t anything more than a middling, dated and occasionally frustrating first-person shooter, which just so happens to take place inside of a rich science fiction universe.